Ya know, sometimes it’s not always the best thing to have all the money to do what you would do if you had all the money. Decorating slowly can have its advantages. 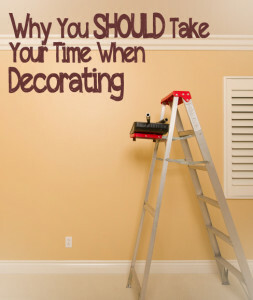 If you have needed to wait until you could afford an item or the means to accomplish a small re-decorating project the advantage to that is by the time you’ve completed a project or room, you tend to discover your very own style rather than a “dime-a-dozen” showroom style by Ashley or even Thomas. Your new room is truly YOURS. We have always needed to redecorate or remodel or finish a basement one board, table, or picture at a time. But you know what? We ended up with a home that is unique from anyone else’s and fits us perfectly. If we would have had the money to have our builder finish our basement at the time we built our house we wouldn’t have anything like it is shaping up to be. Having the time or I guess I should say, having to TAKE the time whether we want it or not, GIVES us the time to think and ponder about our finished project, even if it comes 10 years later. Decorating in one fell swoop leaves us at the mercy of the popular trends of the day. Having the time to piece together a family room can create a space that has our own imprint and becomes a room that will withstand time. Decorating our home is a journey, not a weekend trip!